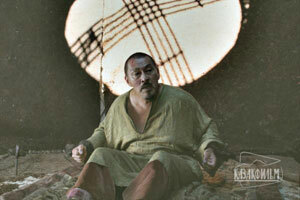 Kazakh cinema is currently going through a rather interesting transformation. Gone are the strong and poetic films that generated meaningful impressions for viewers. 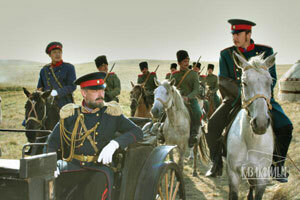 Gone are films that actually engaged and understood the Kazakh past. Instead, we are left with films that place commercial value and film technique above content and form. Kazakh Hollywood, it seems, has arrived. Doskhan Zholzhaksynov and Rymbek Alpiev’s new film, Birzhan Sal, is an attempt to draw contemporary Kazakh film audiences back to their musical past. Indeed, until the mid-twentieth century, no cultural space could rival music in its singular importance for Kazakhs. Even Kazakh literature was marginal compared to music, until the writer Mukhtar Auezov treated the life of Abai in the 1940s. Yet, in the decades since independence, Kazakh music has truly become marginalized in domestic culture, and this film serves to address this issue. Birzhan Sal relates the life of Birzhan Turlybaiuly Kozhagulov (1834-1897), who was famed for his lyricism on the dombïra, the two-stringed lute and national instrument of the Kazakhs. Sal was an honorary title given to Birzhan, noted for his bardic entertainment at weddings and festivals. And, some of his best songs, Adasqaq, Kokshetau (Aitbai), Syrghaqty, Zhalghyz arsha, Zhanbota, Zhonyp aldy, are played in the film. While this is a film about music, the film spends considerable time on his rather infamous love adventures late in life. Since this is a film about music, it is worth noting that the music of the film leaves quite a lot to be desired: it is often melodramatic (like the film) and loses much of Birzhan’s subtle beauty through the use of wind instruments and flutes, which were not a part of Birzhan’s performance. The film begins with the harsh reality of an early snow. In a nomadic, herding, subsistence economy, this portends disaster. Birzhan explains, however: “It is mizamkok season, remember this.” Mizamkok, literally means “September green,” the late-blooming phenomenon of the steppe environment. Perhaps it is an allegory for modern Kazakhstan; it could also reflect upon Birzhan’s own sexual proclivities. A Kazakh hunting party flashes across the screen, chasing a wolf across the steppe. The music is energetic and enthusiastic, until the percussive sound of a rifle shot ruptures the mood. A wolf lies on the ground dying, when a party of Russian officers approaches; an officer asks: “Who are these people?”—“Free people…” Disinterested and disengaged, the Russian officials leave the dying wolf behind. “Free people, you say [Laughter],” one snorts as they depart. When spring arrives, alongside another melodramatic score, we witness the joie de vivre of the Kazakh steppe. Birzhan’s merry band descends upon an encampment in a romantic view of a mid-nineteenth century world. Quite strikingly, we observe close-up shots of each of the horseman in animistic poses and furs, a scene that recalls a similarly iconic moment in Sergei Eisenstein’s The Strike (Stachka, 1925): a snow leopard, a bear, a wolf, a fox, and a white goose, all totemic and legendary symbols for the Kazakhs. Then the light, shadows, and colors of the Kazakh yurt are revealed. Birzhan and his comedic troupe generate a festive celebration. It is a kind of nineteenth-century Kazakh decadence in a yurt, something rarely seen in puritanical and sanitized Soviet views of mass culture. The din quiets as Birzhan’s dombïra is revealed in the film for the first time, and he plays. 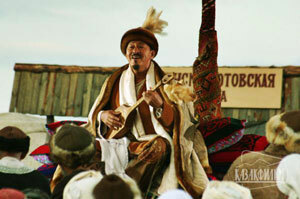 The actor, Doskhan Zholzhaksynov, notably plays the instrument and the instrumental work, Kokshetau (also known as Aitbai) himself. In a cursory way, the film is a love story, albeit an odd romance between an old Kazakh rake and two young women. This takes a little of the romance, in the philosophic sense, away from the film’s deeper musings on music, modernity, and identity. Yet, in fact, Birzhan did have four wives: Balkash, Leila, Aitbai, and Apish. When the female protagonist of the film, Lyailim, sings for the first time, Birzhan is notably impressed. If only she were a man, then he would invite her to join their cheerful bunch. Instead, they play an adolescent game of hide and seek in the woods, celebrating general revelry and the insubordination of artists. If the film’s intent is to humanize this iconic musical figure, it succeeds. Despite the important role of women in Kazakh traditional society, modern Kazakhs still have far to go on gender egalitarianism. Birzhan’s considerably younger wife, Makpal, who ages considerably across the film, asks: “How long should I wait for you? I am like grass under your horse’s hoofs, you trample it, and off you go… this is my fate;” to which Birzhan replies, “Do you expect an oath from me?”—“I am like tumbleweed carried along by the winds…. There is nothing that I can offer you.” The juxtaposition between dark internal spaces and bright snowy landscapes underlines the contrasting nature of Birzhan’s life. The remarkably evocative (and imagined) cultural world of Kazakhs, shown through traveling troupes of performers and lavish communal merriment, is interrupted by a tormented love story. 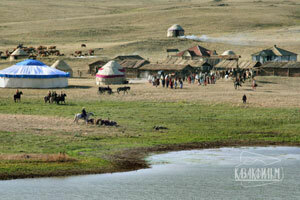 As Birzhan leaves, Lyailim rides up on her horse with a handkerchief. We find Birzhan dizzy in love on the steppe. And, ultimately, when he returns to Makpal, he explains, “My love is like mizamkok… The grass sprouts in the autumn.” His vitality briefly and fatefully conquers the decades that separate him from his new young lover. Accepting this fate, Makpal suggests that Birzhan should take another young wife. Free to pursue his new love, Birzhan achieves a new level of musical creativity. We can connect the film’s narrative with Birzhan’s famous song, Lyailim shyrak. Frolicking scenes, private rendezvous, and horses swimming in the clear waters of Issyk-Kul, their love is revealed on screen. Although meant to replicate the Irtysh River, the latter case is certainly the first use of an underwater camera employed to show swimming horses in Central Asian cinema. Lyailim: If you truly love me, then let’s run away together. Birzhan: Stolen happiness is not for me. Oh, if it was not only me that was humiliated. The time of Kazakhs is finished. And real musicians will be left in the shadows. Who is more important, a bai or a poet? A poet is more important. He sings his songs and does not pay lip service to Tsars. But a Kazakh bai, Nurjan, attacks this jovial lot of artists and the film ends with death, despair, and trees blowing in a violent wind. Talasbek Asemkulov, a musician, writer, and scholar of Tattimbet, wrote the screenplay. 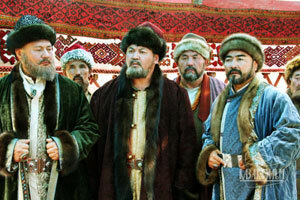 It was meant as a parable and a model for a new generation of Kazakhs film audiences. A last gesture, perhaps, from a generation that feels that young Kazakhs are losing their connections to the nomadic and musical traditions of the past. Noticeably absent from the film is Birzhan’s famous encounter and aitys (musical competition) with Sara Tastanbekkyzy in 1871. In this competition, Sara reflected upon the sometimes-bitter fate of women. It was a rare musical encounter of the nineteenth century that was published as a text in 1898 in Kazan and was explored in Mukan Tulebaev’s 1946 famed opera, Birzhan and Sara. Emerging from a long Russian century, how will this Kazakh memory of Birzhan change? Perhaps Birzhan’s song about Orenburg, Orynbor ani, could reveal the careful play of Kazakhs and Russians on the steppe: distrustful but aware of their inextricable links. 1] Directed by actor, Doskhan Zholzhaksynov, who noted for his acting in Pursuit in the Steppe (1979), Mellow Autumn (1980), House under the Moon (1983), Descendant of the Snow Leopard (1983), Love Mirages (1986), The Nomad (2005). This is his first film as director. 2] Quality recordings of Birzhan Sal’s songs may be found at the Asyl Mura website: http://www.asylmura.kz/ that is available in English, Russian, and Kazakh. See the CD of Zhusupbek Elebekov, in particular. 3] There is a play on the word, nasybaishy, or satirical folk-dancer, here as well since Birzhan and his band are folk performers.